Sunrise crawling over the Mesquite Flat Dunes and Sunset bathing Manly Beacon at Zabriske Point are two of my favorite photo locations in Death Valley. Photographing dry desert landscapes can be a challenging, yet rewarding experience for any photographer. Shooting wide landscapes or tight patterns in the sand, dry conditions can test even the most experienced photographer. The flipside is these conditions often times lead to great photos. Days will typically begin by discussing the locations and subjects before heading out to capture photos. Locations will be determined by the weather and light. After lunch and time permitting in the evenings we will process and share photographs and discuss techniques and digital workflow. $975 per person for workshop A 50% deposit is required to reserve your spot with the balance due 60 days prior to the start of the workshop. 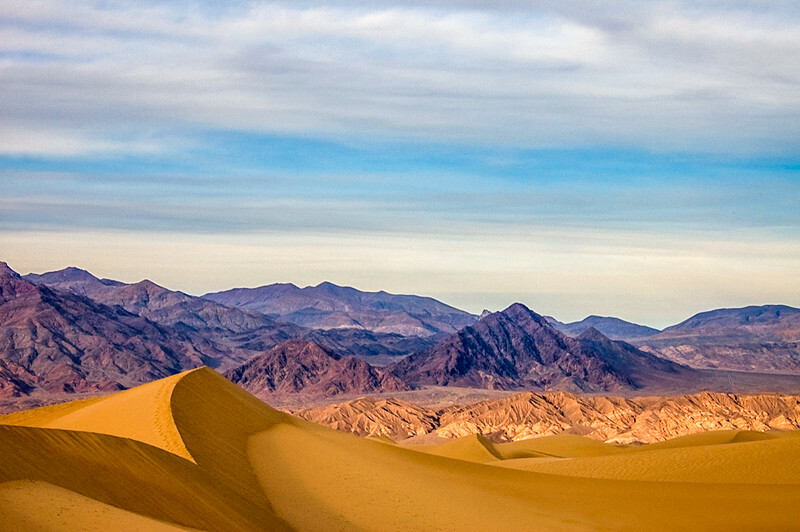 Spring weather in Death Valley can be unpredictable. I strongly advise that you check the conditions before you leave. (depending on your route chains might be required). Highway 395 from Los Angeles is a major North/South highway and is kept in good condition. However access to Death Valley can be challenging if you’re traveling during a storm. If you are traveling from central California please check the road conditions. The closest airport is Las Vegas, NV which is 144mi east of Stovepipe Wells or about 2.5 hours in good weather. You will need to make your own motel reservations in Death Valley. We’ll be staying at Stovepipe Wells Village and have a block of rooms reserved. You can contact Stovepipe Wells Village and mention this workshop and they’ll be happy to accommodate you if there is space. The other option is to camp at the Stovepipe Wells Village Campground/RV Park. Meals are not included in the price of the workshop but generally the group enjoys eating most meals together. We will carpool to shooting locations. Participants are required to provide transportation to and from the workshop. I’ve never had to cancel a workshop however for your peace of mind you might consider purchasing travel insurance to cover any losses resulting from a cancelled workshop. Only paid workshop participants are allowed on location due to permit and insurance regulations. Spouses are welcome to join in meetings. Contact me regarding a spouse rate. Please click on link to read my Cancelation Policy. Why take a workshop with us? Iconic Locations Our workshops take in locations with some of the best scenery in the world. In addition to the best scenery we have been scouting and photographing these areas for years so we know the best locations, times and shots to get. We’re constantly looking for new locations to add too. Small Group Size Our workshops are limited to 8 to 10 participants. We aim to maintain a 4-1 participant to instructor ratio. This insures that you get plenty of one-on-one time with the instructors. This also allows us to go places big photography tours can’t. Fully Insured and Permitted We make sure all our workshops are insured and permitted and we also maintain our First Aid training and update it annually.